BMX helmets, who makes a slim and well-vented one? Discussion in 'The Shop' started by TTB, Apr 22, 2013. I'm after a new helmet for bmxing, hopefully I'm posting in the right place. 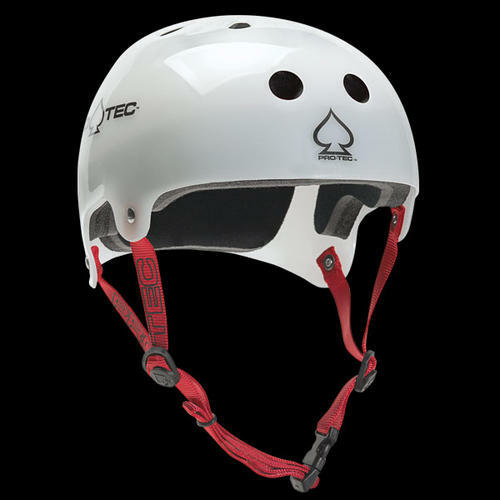 Currently have a Pro Tec Classic which is OK but it doesn't fit my head shape properly - it digs in at the temples and feels like it sits on top of my head rather than around it. It also looks awful as it sticks out a lot giving a huge mushroom look! And it's boiling even on colder days. Basically looking for something with a slimmer cut and better vented. If you took the peak off, that new Bell Super actually looks like it would have the bmx kinda styling but with bigger vents maybe? Open to any suggestions. How about Bern? I personally use fox transition helmet, seems light enough for me and I don't feel its too hot either. not sure if i am going to recommend the one you already have, but bucky lasik has a signature protec helmet thats essentially just the plastic bucket and some foam.. sits superrr low on your head.. i cant stand any of the other non-full face helmets because they sit wayyy to high up and i feel like someone stuck a cone on my head, so i never wore one when i rode.. hopefully ill start wearing this one a little more once the bike is back together.